With both Lionel Messi and Cristiano Ronaldo approaching the final years of their glittering careers, the world of football is almost on the verge of welcoming brand new talents to compete for the mantle of the best footballers on the planet. And while many talented superstars are already in the race to catch up with the two aforementioned juggernauts, one young starlet in particular, who was touted to become a world beater, is still far from being in the contention. This player, is none other than Manchester United forward Anthony Martial. The then-teenager completed his record-breaking move from Monaco to the Theatre of Dreams back in 2015, and immediately became a fan-favourite on his debut, when he scored the decisive clincher against arch-rivals Liverpool. He finished his first season in England as the Red Devils’ top-scorer in all competitions, and the United faithful were confident of having landed a future Ballon d’Or winner in their roster. However, fast forward 3 years later, and Martial isn’t even a guaranteed starter at his current club, never mind the best in the world. Despite developing rapidly under former boss Louis van Gaal, the France international seems to be struggling under the Dutchman’s successor, Jose Mourinho. Martial did begin the ongoing 2017-18 campaign in hot form, but that fire seems to have dwindled for some reason as the season has progressed, much to the dismay of the supporters. Upon his arrival in Manchester, Martial fit into Louis van Gaal’s system as the chief striker of the team. However, when Mourinho entered the fray, the forward was shifted onto the left wing – a position wherein he initially struggled to adapt, but showed glimpses of brilliance from time to time nonetheless. The 22-year-old finally appeared to have become comfortable on the left wing at the start of the ongoing campaign, as he not only bagged a handful of goals and assists, but also had a major impact on the overall attacking play in the first half of the season. However, since United signed Alexis Sanchez in the January transfer window, the Chilean international seems to have become Mourinho’s go-to left winger, whilst Martial has been shifted onto the right wing. This positional change has tremendously affected the Frenchman’s form, as evident from his recent displays. Fans on social media have noticed the same, and have since been complaining about this switch, urging the Portuguese tactician to restore Martial back on his preferred left wing. However, their prayers have remained unanswered so far. Jose Mourinho’s tactical system demands all his players to defend their goal as a unit, which has led to his philosophy being labeled as the ‘Park The Bus’ approach. However, the former Chelsea boss asks his teams to defend altogether nonetheless, and this strategy often ends up affecting his own attacking players. Anthony Martial has undoubtedly suffered from a similar case. While he was mainly seen terrorizing the opposition defenders around the penalty area during Van Gaal’s reign, he now spends a lot of his time helping the United full-backs deal with the opposition forwards in the wide areas. Furthermore, Mourinho also happens to have a preference for Marcus Rashford over Martial during his team selection against the top teams, mainly due to the Englishman’s superior defensive abilities and industrious nature. One could only imagine how much more effective and lethal a forward as good as Anthony Martial would be when stripped off all the defensive burdens, with orders to simply and only attack the goal. Manchester United legend and Sky Sports pundit Gary Neville summed up Martial’s problem at the Mancunian outfit perfectly during his podcast back in November, as he explained: “It’s been a stop-start Manchester United career for Martial. For someone of his talent, he should be tearing this league apart with his ability. “There’s obviously something wrong with him. You always get the feeling he’s playing at 85 percent. If he showed that extra 15 percent, then he could do anything. 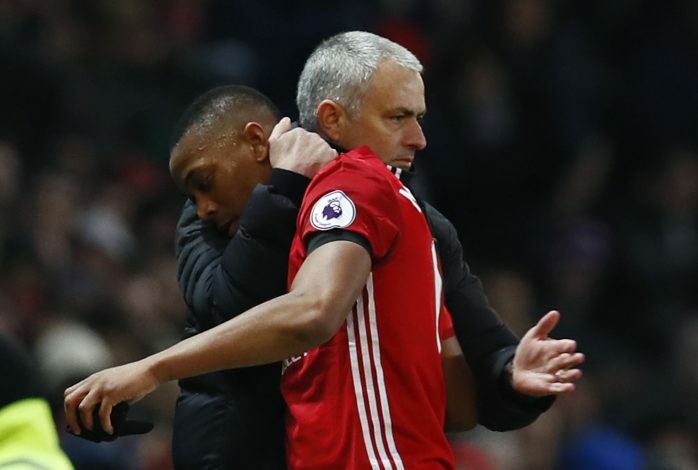 However, despite putting in some brilliant performances and finding the back of the net consistently, Mourinho has failed to give Martial a consistent run of games. The manager was specifically asked about the reason behind the French starlet’s inconsistent selection following United’s 4-2 away win over Watford back in November, to which Jose replied by blaming the player’s “biological situation. “I think he suffers a little bit with accumulation of matches. I could feel that in the second half he was going down and down and down. He’s still a young guy and his body, his biological situation has space to improve,” Mourinho was quoted as saying. Whether physical issues are genuinely the reason behind the wide-man’s irregular selection, or if it’s simply too much competition for the same position or even tactical factors, the answer remains a matter of speculation. However, what is abundantly clear to all is that Anthony Martial is one of the best footballing talents on the planet, and unless Mourinho gives him a string of back-to-back games in his preferred position with the license to kill, the forward will remain an average Manchester United player, or eventually head out the Old Trafford exit door to realise his full potential elsewhere. The ball, as they say, is now in Mourinho’s court. If man city could rotate their strikers and could be effectively, I see no reason why man utd can’t do the same. Mourinho should look for an effective formation to bring out the best in his attackers.